You might have noticed some of our fellow fansites throughout the day were giving away tickets to a special Hunger Games Fan Marathon Screening featuring all four Hunger Games films, as well as other activities for the fans and even a Q&A with cast members. Well, fear not, because we’re also going to be giving away tickets soon, but to give each of you reading this more of a chance (and not have this turn into a literal Hunger Games-style bloodbath), we’re going to be doing things a little bit differently. 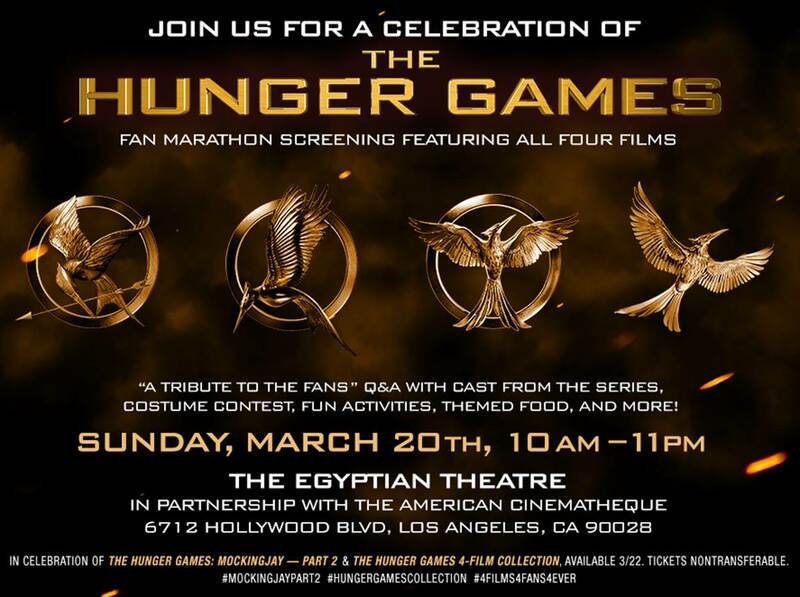 If you’re in the L.A. area or are willing to travel to L.A. for this event on March 20th, then you have to make sure to stay tuned to our site tomorrow: at 5 pm ET / 2 pm PT we’ll publish a follow-up post with a THG trivia question for you all to answer in a comment. I (Carla) will reply to the first 5 people who answer the question correctly, asking for your Twitter handle. You must have a Twitter account in order to participate, as it’s the fastest way to get the RSVP link to you. We will send the link via DM; in order to receive a DM from us, you must be following our Twitter account @HGJabberjays, otherwise we’ll be unable to message you. You must not share the RSVP link with anyone; if we find out such a thing is happening, we will ask Lionsgate to invalidate however many tickets necessary. If all is done correctly and within the rules, your ticket will be valid for you and one guest, so there’s no need to use the RSVP link twice.